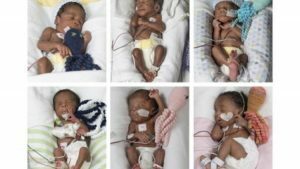 Photos: 40-man US team delivers Nigerian woman’s sextuplets – Royal Times of Nigeria. 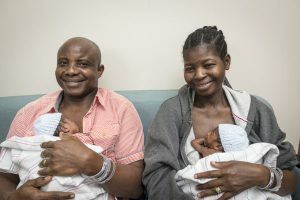 A 40-person team at US Virginia Commonwealth University(VCU) Medical Centre successfully delivered Nigerian Ajibola Taiwo of sextuplets on 11 May, according to a story published on its website. Ajibola Taiwo from Western Nigeria, was 30 weeks and two days pregnant when she gave birth to three boys and three girls by cesarean section. The babies ranged in weight from 1 pound, 10 ounces to 2 pounds, 15 ounces. All six are doing well and continue to thrive in the Children’s Hospital of Richmond at VCU neonatal intensive care unit. The Taiwos tried to conceive for 17 years and were overcome with joy when they saw four heartbeats at their first ultrasound in November. It was not until January when they arrived at VCU Medical Centre that they learned they were expecting sextuplets. According to the Centres for Disease Control and Prevention, in 2015 there were nearly four million live births in the United States, only 24 of which were quintuplets or other higher order births. Delivering sextuplets requires a coordinated team effort including many hours of planning and simulation. The Taiwos’ medical team included experts from maternal-fetal medicine, labor and delivery, nursing, anesthesia, respiratory, neonatal medicine, social work, nutrition, cardiology and chaplain services. “The team quickly assembled to begin prenatal management and delivery planning including pre-delivery drills and resuscitation exercises,” said Susan Lanni, M.D., medical director of labour and delivery and maternal-fetal specialist at VCU Medical Center. Developing a relationship with the mother and father was a critical component to the successful high-risk delivery. Adeboye Taiwo said everyone performed beyond his expectations from the time they arrived at VCU Medical Center. Ajibola Taiwo was discharged from the hospital May 18. She and her husband actively participate in the sextuplets’ care in the NICU. “This is an amazing medical accomplishment that would not be possible without the outstanding coordination of our obstetrics and neonatal teams,” said Russell Moores, M.D., medical director of the Neonatal Intensive Care Unit at Children’s Hospital of Richmond at VCU.